Two of earths most successful lineages meet in the cold waters off japan: Homo sapiens, and the giant squid Architeuthis dux. Eyes of a giant squid is the creepiest thing. I've commented on this before, but I will so again, because I remembered that an encounter between a diver and a giant squid did occur on Christmas Eve in Toyama in 2015. The squid was, after a few hours of being observed, guided back out to the open sea, where it disappeared back into the depths. Basically, this scene you depicted here eventually happened. I saw the video! I hope the squid was OK, pretty weird for it to head shoreward like that! Best Giant Squid Art ever! I love giant squids...so huge, but so peaceful. Certainly! I am taking paid commissions now, so drop me a note if you are interested. Could you please email me on gunn@deepsubllc.com to discuss further. I'd love to be able to meet a giant or colossal squid in person. We're not in their prey range, so I'd be reasonably hopeful I'd come out unscathed. You need to join the antarctic fishing fleet! I agree, there are far too many humans. Isn't that squid just a kid? A jelly would be cool... Maybe a Cubozoan. I have long waited for the day that by chance I come across a true monster of the deep. Humbolt squids and Giant squids are the reason I don't want to swim after dark or alone in the deep and I want to send rovs to find the monsters down there. Nice picture, i'd say the diver is in a extraordinary position but could be a fatal one too. They better have their diving knife! 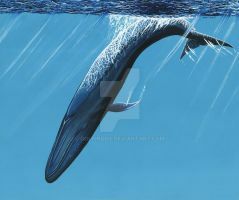 If i would be the diver, would use my harpoon to kill that giant monster befor it would chew me up. Very frightening! Hopefully giant squids don't like to eat people. Nicely done. I definitely would not want to be that diver! i am so happy Tsunemi Kubodera finally filmed one in its natural habitat on video, even if it was just a baby. It was so cool! But it looks like that means I got the eye wrong; it wasnt round at all! actually the eye was like that because they had flashed it with white light and was likely temporarily blinded. I am so happy for Dr Kubodera and the others I wish I could have been there in person but at least after all this time we have footage of them in their natural habitat. Was it blinded? I thought they used infrared cameras. they did but the infrared light was making it hard to determine if it was a Giant squid or another species so they risked using white light on it for a minute. It likely turned that silver color out of shock but was more occupied eating the smaller squid. Gods, 25 feet long, how crazy would that be to be in the water with it! its still awesome. i personally think the squid also escaped a sperm whale, because its two feeding tentacles were missing. Hopefully it can grow them back before it starves. of course it can. cephalopods can easily regrow an arm if it is lost. as long as they have 1 or 2 to grab with, they can easily survive while the rest regrow.